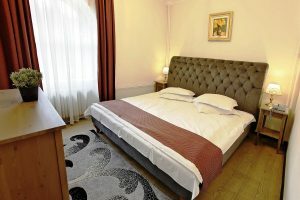 Book now at Caraiman Hotel and enjoy the privilege of staying in a neoclassic Romanian style building opened in 1881, a true Monument classified as National Patrimony. 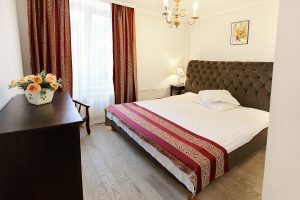 Caraiman is one of the first and oldest hotels in Sinaia, strategically located to have a large opening view towards Bucegi Mountains and Dimitrie Ghica Park, right in the center of the town. Sinaia Casino, Palace Hotel, Commercial Center and Sinaia Monastery are just few of the places reachable in few minutes of walking. 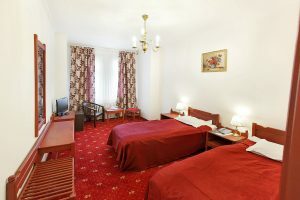 Recently renovated Caraiman Hotel has now 71 rooms: 10 studios, 61 single & double rooms, a Romanian cuisine restaurant, conference rooms, summer terrace, cleaning & laundry services, beauty salon, reception safe-deposit box, free parking. 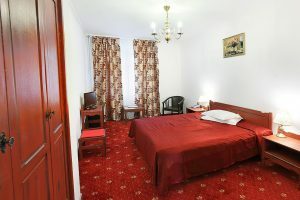 Most of the rooms have park views and offer all the comfort needed for lovely vacations. 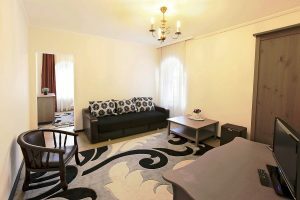 All rooms have cable LCD, minibar, direct phone & Internet.